Four badass women lose their heads in this irreverent, girl-powered comedy set during the French Revolution’s Reign of Terror. 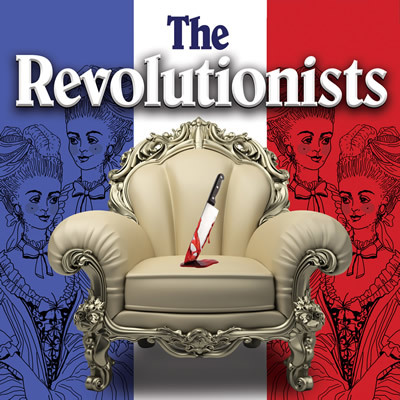 Playwright Olympe de Gouges, assassin Charlotte Corday, former queen (and fan of ribbons) Marie Antoinette, and Haitian rebel Marianne Angelle hang out, murder Marat, and try to beat back the extremist insanity in 1793 Paris. This grand and dream-tweaked comedy is about violence and legacy, art and activism, feminism and terrorism, compatriots and chosen sisters, and how we actually go about changing the world. 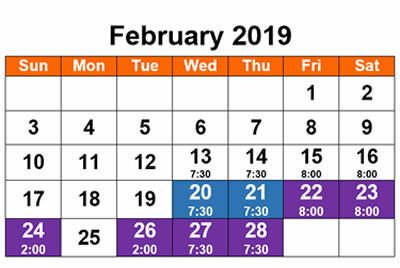 Previews on February 20 & 21, all seats $17.50 for Previews only. For other pricing, see our tickets page. Opening Night: February 22 - wine and cheese reception before the show. 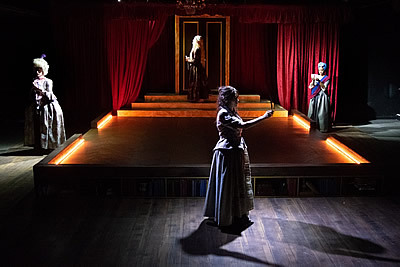 Playhouse Artistic Director Sean Harris speaks about Lauren Gunderson's play THE REVOLUTIONISTS. OLIVIA JAMPOL (Charlotte Corday) Playhouse on Park debut! 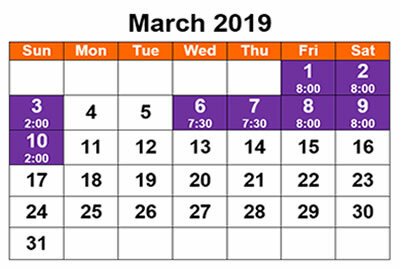 Theatre Row: Lucille GEMINI; The Flea Theater: Meg AJAX, The Woman WOLF IN THE RIVER, Leslie NEIGHBORHOOD 3: REQUISITION OF DOOM; HB Theatre: Roz YOU CAN'T PLAY BARBIES; Ars Nova: V.A. 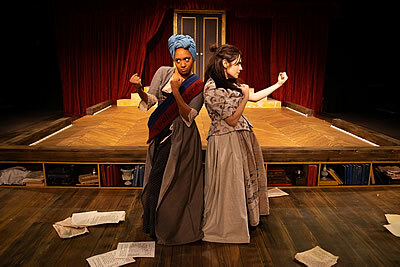 White GOOD MEN WANTED; American Repertory Theater: Marquis de Sade MARAT/SADE, Lysistrata LYSISTRATA. Olivia is a Costa-Rican actor and graduate of Harvard University; she is thrilled to be working with Playhouse and very thankful to her wonderful family and management! ERIN ROCHÉ* (Marianne Angelle): Playhouse on Park debut! ; Ensemble Studio Theatre: Ensemble ASKING FOR TROUBLE; ANT Fest at Ars Nova: Ensemble HOTTENTOTTED; Barrington Stage Company: Kerry KUNSTLER; The Old Globe: Helena ALL'S WELL THAT ENDS WELL, Bianca OTHELLO, Lucetta TWO GENTLEMEN OF VERONA, Cobweb A MIDSUMMER NIGHT'S DREAM, Dorcas THE WINTER'S TALE, Ensemble PYGMALION; Actors Theatre of Louisville: Q HEIST!, Vivian POST WAVE SPECTACULAR; Providence Black Repertory: Blue DONE. Training: BA, Brown University. MFA, Old Globe/University of San Diego. SARAH HARTMANN (Director) is a New York based director, actor, and writer. Upcoming work includes: Dubuque Symphony Orchestra, DIE ZAUBERFLÖTE; Cheyenne Symphony Orchestra: STAR-CROSSED LOVERS: A ROMEO AND JULIET STORY. She is currently the Associate Director of ANASTASIA for both Broadway and the First National Tour. Previous directing credits include: Dubuque Symphony Orchestra: STAR-CROSSED LOVERS: A ROMEO AND JULIET STORY; NYU: MILLENIAL PINK FALCON; (NYU), Shakerbridge Theater: THE HOW AND THE WHY; Chautauqua Theatre Company: her own radio play adaptations of FRANKENSTEIN and DRACULA; Barnard College: SORRY, WRONG NUMBER; UCSB: THE HITCHHIKER; and staged readings at the New School, Tisch School of the Arts, Dramatists Guild, and Barnard College. Assistant directing credits include: 2nd Nat'l Tour: A GENTLEMAN'S GUIDE TO LOVE AND MURDER, HAMLET, PRIVATE LIVES; Hartford Stage/The Old Globe (dir. Darko Tresnjak) KISS ME, KATE; Hartford Stage: Matthew Lopez's World Premiere of REVERBERATION; Charlottesville Opera: THE MARRIAGE OF FIGARO; UCSB: STREETCAR NAMED DESIRE; The Juilliard School: THE MERCHANT OF VENICE, STREET SCENE, ROMEO AND JULIET, ALL&#39;S WELL THAT ENDS WELL, MACBETH, ARMS AND THE MAN. Acting credits include: DSO: Juliet; Shakerbridge Theatre: THE LYONS; Casa Italiana: THE GOLDEN COCKEREL; Ontological/Hysteric Theatre YELLOW ELECTRAS; Oval House Theatre: the title roles in MARIANA PINEDA and ELEKTRA. She spent a year studying at the British American Drama Academy, holds an AB from Barnard College, and an MA from Columbia University.